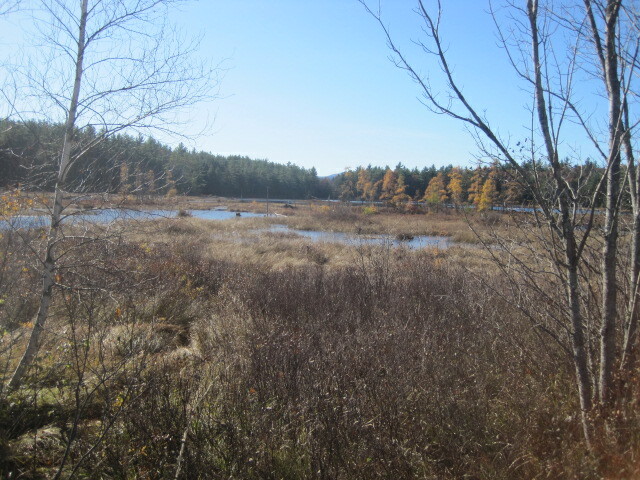 The Madison Conservation Commission and the heirs of the Malcolm P. McNair Conservation Easement joined together to create a scenic trail around 3/4 of the circumference of the Durgin Pond in 2010. Durgin Pond is located on East Madison Road. Donated to the town in 1976, the easement comprises 143 acres of forest land surrounding Durgin Pond. The trail was laid out to offer our community a unique opportunity to view a local scenic pond environment. There are a few steep slopes and stream crossings. Plans are underway to complete the trail along East Madison Road through applications to the state’s wetlands boards. Currently we urge hikers not to walk along the road as cars travel very fast. This entry was posted in Durgin Pond on July 15, 2012 by madisontrails. The Louise S. Wold Conservation Land is a 71 acre woodland located on Allard Hill Road on the east side of Madison, off Tasker Road. It was donated in 2004 by Mrs. Wold. A nice trail is accessed above the road side field from a parking lot in the northeast corner. There are two impressive scenic views on the lot. The trail is a bit challenging to follow sometimes but look for the next marker! Have fun in the forest! This entry was posted in Louise Wold Conservation Land on July 12, 2012 by madisontrails. This entry was posted in Madison Cascades on August 30, 2011 by madisontrails. This entry was posted in General info and tagged Geocaching, Letterboxing on August 18, 2011 by madisontrails. CONCORD, N.H. – Great news for New Hampshire hikers, hunters and outdoor enthusiasts: the N.H. Fish and Game Department has created topographic maps of the entire state, available for free at http://www.wildnh.com/maps. The topo maps, in PDF format and sized to print on an 8.5″x11″ sheet of paper, include the latest available geographic information for the state at a scale of 1:31,680 (1 inch per half-mile). The maps include roads, municipal boundaries, water bodies, conservation properties, state and national forests and parks and more. To find a map, go to http://www.wildnh.com/maps, click on Topo Maps, and click on a town name. A small map of the town will come up, with red lines and labels to show each available PDF topo map. Below the small map is a list of map names keyed to the labels shown. Click on the name of the map you want to download. Each PDF map is less than 500 KB in size for fast downloading, and may be opened with Adobe Reader version 8 or newer. Each topo map represents a quarter of a U.S. Geological Survey “quad” map; 851 of these “quarter-quads” cover the 259 towns and unincorporated places of New Hampshire, and each is available as a topo (showing land contours) or with a photographic background. The background scanned images of U.S. Geological Survey paper topographic maps are from the National Geographic Society provided through ArcGIS Online, a map service with land cover imagery for the world and detailed topographic maps for the United States at multiple scales. The photography (2009) is from the National Agriculture Imagery Program. The other data layers are from NH GRANIT, the statewide geographic information system clearinghouse. The New Hampshire Fish and Game Department works to conserve, manage and protect the state’s fish and wildlife and their habitats, as well as providing the public with opportunities to use and appreciate these resources. Visit http://www.wildnh.com. This entry was posted in General info on October 28, 2010 by madisontrails. The Ward Parcel trail is a short walk behind the ball fields on Rte 113 near the school. The total Ward Parcel is 47 acres. The trail is flat and wanders in the trees. The trail was first laid out in 2004 before an Old Home Week Conservation Walk. The trail was updated by resident Torin Laliberte for his Eagle Scout project in 2012. A new entrance was constructed by Torin. 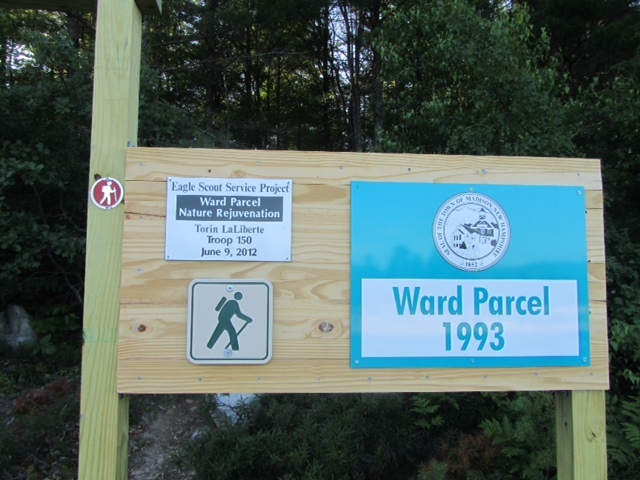 This entry was posted in Ward Parcel on July 20, 2008 by madisontrails. NOTE: This trail is closed in summer 2014 while construction on Madison Historical Society building takes place. Marked trail, follow signs starting to right of Historical Society Building. Various wooded terrain gains elevation to a cascading brook. This entry was posted in Madison Cascades on July 20, 2008 by madisontrails.